Babson men’s basketball has been the top ranked DIII college program for a good portion of the season and former HockomockSports.com Player of the Year and Franklin Panther Sam Bohmiller has played a vital role. The Beavers (21-1) are riding a 12-game winning streak heading into Saturday’s visit to Clark. Bohmiller has started in 20 games this season (missing two for an injury), averaging 29 minutes per game. Shooting at 53.4% from the field (49.2% from three point), Bohmiller is averaging 7.6 points per game as well as 2.2 assists, 2.6 rebounds and nearly 1.0 steals per game. Mansfield’s Joe Collins has had a terrific year for Southern New Hampshire’s hockey team through 26 games. A graduate student, Collins is second on the team with 11 goals, first on the team with 21 assists and leads the Penmen with 32 points. His +8 is second on the team and his three game-winning goals is tied for the most on the team. Collins is currently riding a three game point streak, recording two against Daniel Webster, one against Franklin Pierce and two against Framingham State. Collins will conclude his final regular season on Saturday in Foxboro against Stonehill. Taunton graduate Angie Martinez etched her name into Mount Ida’s record books twice this season. In early December, Martinez became just the fourth women’s basketball player in program history to join the 1,000 point club. Less than a week later, Martinez became the first ever Mustang to record 1,000 rebounds. She then took her success to another level in January, hauling in her 1,125th career board, making her the all-time women’s rebounding leader in Great Northeast Athletic Conference history. For her senior season, she is third on the team with 9.1 points per game and leads the Mustangs with 12.1 rebounds and 1.3 blocks per game. Bridgewater State currently sits at 13-9 overall and 6-3 in MASCAC play, good enough for third. The Bears are coming off a win over league-leading Salem State in a game that saw Taunton grad Fawaz Mass drop a game-high 23 points and former HockomockSports.com Player of the Year Rocky DeAndrade chipping in with 16 points. Mass (16.2 ppg) and DeAndrade (14.4) are currently the top two in scoring for the Bears while Mansfield’s Greg Romanko, a captain is at 8.8 points per game and Milford’s Michael Soares is at 4.3 points per game. Mass is second on the team in rebounding and DeAndrade leads the Bears in assists. Soares scored a career-high 19 points late last month in a win over MCLA. Romanko also scored a season-high 19 points back in December in a rout of Maine-Augusta. Bridgewater travels to Worcester State on Saturday to battle Milford graduate Aaron Anniballi and the Lancers. Anniballi turned it on midway through the season and was rewarded, earning starts in the last five games and six of the last seven. In a road trip to league-leading Salem State, Anniballi dropped a career-high 22 points, including a career-best five three pointers made. In the last five games, Anniballi is averaging 11.2 points, 5.0 rebounds and 3.4 assists per game for the Lancers. For the season, he’s second on the team in assists and fourth in scoring despite just seven starts. Success on the ice at Saint Anselm is noting new for the Spillane family though, as Kaitlyn Spillane, a junior, continues to be a big piece of the Hawks’ women’s hockey team. After 12 points as a freshman and 24 points as a sophomore, Spillane is already up to 26 points during her junior campaign. Her 26 points is good for second on the team, a combination of 10 goals and 16 assists. She’s currently riding an eight game point streak heading into Friday night’s tilt with Williams. During that stretch, she registered four points in a win over New England College. Michael Choate has strung together two strong meets for the Boston University swim team. The former KP Warrior had three top three finishes against Boston College, including third in the 100 backstroke (52.79), third in the 200 butterfly (1:58.57) and second in the 200 backstroke (1:52.11). He followed that up with three more top three finishes against Bryant, including second in the 200 free (1:47.26) and third in the 500 free (4:56.08). He was also apart of the 200 medley relay that took third (1:38.76). North Attleboro’s Sarah Hargrave also had solid showings in the same meets. On senior night against BC, she took first in the 500 free (4:57.16) and first in the 200 free relay (1:37.34). Against Bryant, she placed third in the 100 free (54.43) and was apart of the 400 free relay that touched in third (3:49.61). 2016 HockomockSports.com First Team selection Alecia Quinones has been a top option off the bench for UMass Boston this season. The Stoughton High product has come off the bench and appeared in all 22 games for the Beacons, averaging 5.0 points, 2.8 rebounds and shooting nearly 40% from the floor. Quinones showed what she can do when she played 23 minutes earlier this season at Colby College. She scored 20 points on 8/13 shooting in the win for UMass Boston. A trio of former Hockomock rivals turned teammates are playing a big role for UMass Amherst’s men’s swimming team. Attleboro’s Owen Wright, Franklin’s Austen Sholudko and King Philip’s Chris DiGiacomo have all helped the Minutemen as they head into Atlantic 10 Championships next weekend. In their latest meet against Fordham, Wright took first place in the 50 yard free (21.53), fourth in the 100 yard free and was apart of the 200 yard free relay team that took second place. DiGiacomo took first place in the 200 yard backstroke, second in the 200 yard IM and placed third in the 200 yard free. Sholudko placed fifth overall in the 1000 yard free and was seventh in the 500 yard free. Bristol Community College has racked up 13 wins so far this season and is averaging an impressive 88.6 points per game as a team. Former HockomockSports.com Boys Basketball Player of the Year and Taunton standout Jose Mercado is currently third on the team in scoring with 13.8 points per game, fifth on the team with 4.5 rebounds a game and second with 2.0 steals. After coming off the bench for the majority of the season, Mercado has worked his way into the starting line up, starting five straight games. In that stretch, he’s averaged 16.4 points, 5.6 boards, 3.2 assists and 2.4 steals for the Bayhawks, who are 4-1 with him in the starting lineup. Former HockomockSports.com Girls Basketball Player of the Year Kat Tamulionis has found a new home at Babson and recently helped the program to its 600th win. The Foxboro alum has appeared in 14 games, earning her first collegiate start at Mount Holyoke on January 21st. In the program’s 600th win, a 72-51 win over Emerson, Tamulionis scored a career-high eight points Another former Foxboro standout Ashley Snyder has made nine appearances for the Beavers so far this season, playing a season-high 12 minutes against Emory & Henry earlier this season. There were plenty of Hockomock alums on the court on Wednesday night when Wheaton visited Clark University. Foxboro’s Rob Lowey and Alex DuBrow dressed for the visitors while Milford’s David Mercier and Joe Atkinson are both captains for the Cougars. In just his second collegiate start, DuBrow made a big difference down the stretch for the Lyons. The freshman hit a pair of free throws with 51 seconds left to give Wheaton a four point lead and then stole an inbounds pass with 22 seconds left, adding one more free throw to help ice the game. DuBrow tied a career-high with 13 points in the game while adding four assists. On the season, he’s averaging 6.8 points, 2.7 assists and leads the team with a 1.6 assist/turnover ratio. Mercier had a game-high 21 points while Atkinson added 16 in the loss. For the season, Mercier is fourth on the team with 10.7 points and fourth in rebounding at 4.2. Atkinson is the team’s top rebounder with 7.5 boards a game and is averaging 11.8 points for Clark (13-9). Taunton’s Dylan Schrama had a strong showing in Clark University’s meet with WPI at the end of January. Competing in five events, Schrama was first for Clark in three events and touched the wall before anyone else in one event. He took first place overall in the 200 yard IM, clocking in at 2:15.42. He also placed fourth in the 50 yard backstroke and took third in the 100 yard free style. He was also a member of the 200 yard medley relay that came in third overall. King Philip graduate and current Northeastern sophomore Carly Schnabel was tabbed as the Colonial Athletic Association (CAA) Swimmer of the Week. She’s the first Northeastern swimmer to earn the honor this season. Competing at Harvard, Schnabel turned in a historic performance in the 1,000-yard free by setting a new program record in 10:03.95 for first place. Her time is over seven seconds ahead of the next closest conference competitor for the event this season. Keene State snapped a two-game skid with the help of King Philip alum Jimmy Layman. The junior forward came off the bench to score 13 points (5/8 FG), had four rebounds and came away with three steals. The Owls (15-7) recently were ranked 10th in the Northeast in the NCAA Regional Rankings for DIII. Layman has a been a top contributor off the bench so far this season, playing in 21 games and averaging 3.8 points per game and 2.1 rebounds. He scored a season-high 17 points back in December at WPI. Less than a week after Mansfield junior Tyler Boulter set a new program record for most threes in a game (10), older brother and former Hockomock League MVP Ryan Boulter decided it was his turn to set a record. In Merrimack’s home game against Southern Connecticut, Boulter put on a show – connecting on nine three pointers to tie the school record. The sophomore forward finished with a career-high 40 points in the Warriors’ overtime win. Although just a sophomore, Boulter is currently leading the Warriors with 18.2 points per game, averaging 3.3 threes in contest. He also is hauling in 4.4 boards on average. UMass Dartmouth women’s basketball program is used to having a Hockomock alum leading the way, and this year is no different. After years of dominance from North Attleboro’s Meg Ronaghan, now it’s Franklin’s Alicia Kutil that’s leading the way for the Corsairs (19-3). Kutil is second with 13.6 points per game and 8.0 rebounds per game, while adding 2.4 assists, 1.6 blocks and 1.2 steals. She was named the Little East Conference Player of the Week earlier this week. Mansfield’s George Apostolopoulos qualified for the NEISDA Division II/III Championships in the 50 breaststroke over the weekend at the Bridgewater State Bears Invitational. Apostolopoulos posted a time of 35.43 seconds in the 50 breaststroke to qualify. Attleboro’s Dylon Willis helped the Bears to a pair of wins at a tri-meet at the end of January, beating Husson and Regis. Willis was apart of the 200 medley relay team that came in second, took first in the 50 yard breaststroke (28.08) and the 100 yard breaststroke and was second in the 100 IM. Also at Bridgewater State, Mansfield’s Abbie Grant and Danielle Souza, North Attleboro’s Adi Tobias and King Philip’s Emily Garven are swimming for the Bears. At the BSU Bears Invitational, Grant was second in the 50 yard butterfly and the 100 yard IM, Souza took third in the 200 yard free, Tobias grabbed second in the 100 yard butterfly and Garven won the 50 yard backstroke as well as the 100 yard free. Attleboro’s Bri Hochwarter is averaging 13.6 points per game and has been a big reason why Wheelock College women’s basketball has registered 10 wins this season. She is also averaging 3.4 rebounds, 1.7 assists and 1.2 steals for the Wildcats. Hochwarter is on a strong stretch, scoring in double figures in four straight games. She’s hit 14 threes in that stretch, averaging 16.8 points per game. Former Mansfield Hornet and Winnipeg Jets draft pick Erik Foley is enjoying another successful year at Providence. After an impressive freshman year (seven goals, 12 assists), he’s already topped his rookie point total during his sophomore year. He’s tied for a team-high 10 goals and also has 13 assists, good for 23 points – third for the Friars. Providence is 17-8-4 on the season and ranked #11 in the country. With the NEWMAC Championships on the horizon next week, Taunton’s Kyle Werra and WPI’s men swimming team are looking to make a slash. Werra has competed in eight events for the Engineers so far this season. At the Clark University Cougar Invitational, Werra set three best times for the season. In the 200 free, he clocked in a 1:57.85, in the 100 breaststroke he touched the wall at 1:08.12 and in the 400 medley, he timed at 4:45.18. Oliver Ames alum Caitlyn Abela continues to be a big piece for Saint Anselm. The Hawks, who have former Canton assistant Colleen Moriarty on the staff, stand at 15-8 on the season. Abela is second on the team at 10.9 points per game, scoring a season-high 23 earlier this year in a win at Daemen. She’s also averaged 3.3 rebounds a game this year (season-high 11 at Adelphi) and 1.1 assists (season-high 4 vs. NYIT). A pair of former Hockomock rivals are now teammates at Merrimack. Franklin’s Lexi Martin and Attleboro’s Emily Houle are both contributing for the Warriors (11-11) this season. Martin, a sophomore, has started in all 22 games this season, averaging 8.9 points, 5.2 rebounds and 1.6 assists per game. She scored a season-high 19 points in a win over New Haven in early January and had a stretch in which she scored in double figures in six of eight games. Houle, a freshman and last year’s HockomockSports.com Girls Basketball Player of the Year, has played in 11 games, scoring five points in a game at Adelphi against former head coach Missy Traversi and hitting a three in a close win over St. Michael’s last week. Former Mansfield Hornet Kevin Conner has scored 13 points in back to back games for Mount Ida heading into this week’s contest with Rivier. The Mustangs (14-8 overall) are currently in fourth place in the Great Northeast Athletic Conference. Conner, who was slowed by an injury to start the season, has started in every game he’s been available for. In a win at Rivier, Conner was a perfect 6/6 from the field and in a loss to conference-leading Albertus Magnus, Conner added 13 points including a pair of threes. In 17 games, Conner is averaging 8.6 points, 3.2 rebounds and 1.6 assists a game. Attleboro’s Kerri Beland is having a strong sophomore season for the Salve Regina women’s basketball game. The former Attleboro Bombardier is leading the Seahawks in scoring with 12.5 points per game, shooting 40% from the floor and 36% from three point. She’s also fourth on the team in rebounding with 5.3 boards. Ever since the turn of the calendar, former Franklin standout Chris Rodgers has gone on a tear for WPI. After coming off the bench for the start of the season, Rodgers picked up his first start on December 6th. In his last seven starts, dating back to January 18th, Rodgers has been one of the Engineers top options on offense. He scored a season-high 23 points and hauled in nine rebounds in a narrow loss to Springfield and scored in double figures in six of those seven games. He’s averaging 15.9 points, 5.9 rebounds and 3.1 assists in that span for WPI, who have four wins in that same stretch. 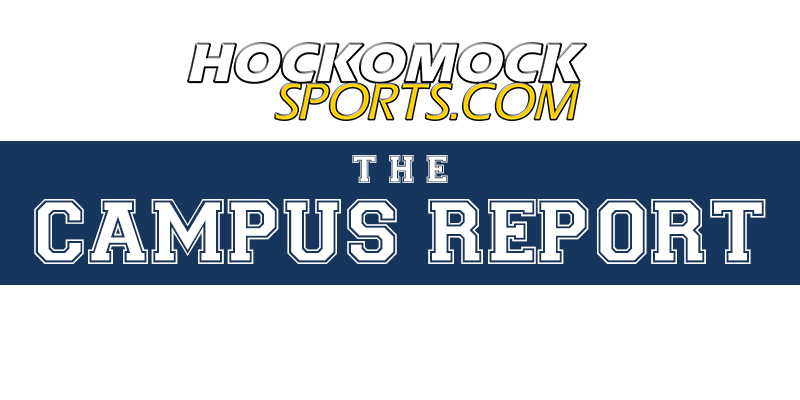 Click here for the HockomockSports.com Girls Basketball Awards for the 2015-2016 season. Below are the official Hockomock League Girls Basketball All Stars, selected by the coaches in the league. NORTH ATTLEBORO, Mass. – Offense was in short supply in the Kenneth Pickering Gym on Tuesday night, as for long stretches North Attleboro and Stoughton looked like there was a lid over both baskets. In the end, the home team had just enough spurts of scoring coupled with a strong defensive effort to hold off the Black Knights and pull out a 45-26 victory that puts the Rocketeers within one win from clinching a spot in the state tournament. The game was essentially decided in the first half. North Attleboro ran out to a 13-1 lead after the first quarter with five players getting on the board, including Ashley Ahern who scored five of her seven points on the night. It did not get much better in the second. With 4:22 remaining in the half, Stoughton had the lone point of the quarter on a free throw by Ava Seigel, who also scored the Black Knights’ lone point of the first. With 3:07 left in the half, Stoughton got its first field goal on a jumper by Sarah Quattrucci to cut the lead to 10. North put together a 9-0 run to close out the first half with all nine points coming in the final three minutes of the second. Caroline Collard (team-high nine points) knocked down three straight free throws and then the lid lifted for a couple of minutes to allow Emily Haskell and Julia Feid to knock down threes for their only points of the game. Stoughton came out of halftime and scored as many points in the opening 1:55 of the third quarter as it did in the entire first half. Senior Alecia Quinones, who came in as the league’s leading scorer, suddenly found her groove driving to the basket and scored all of her game-high 11 points in the quarter and got the Black Knight as close as 12 twice. North answered again. Emily Schromm picked up a steal and took it the length of the floor for a layup and Liz Morehouse came off the bench to score in the paint. Collard hit two free throws and then Samantha Taggart scored four quick points to end the quarter and send the Rocketeers to the fourth up by 16 (35-19). The Rocketeers were like a boxer who knows when the end of the round is coming and always seemed to put together the spurt they needed to extend the lead. After Jordan Motley opened the fourth with a basket, Collard scored plus the foul and Schromm (six points) added a pair of layups to extend the lead out to 21. Stoughton could not keep up with the Rocketeers offensively, but did hold its own on the boards. In a game with plenty of rebounds to be had, Val Whalen pulled down a game-high 16 and Motley added 10. 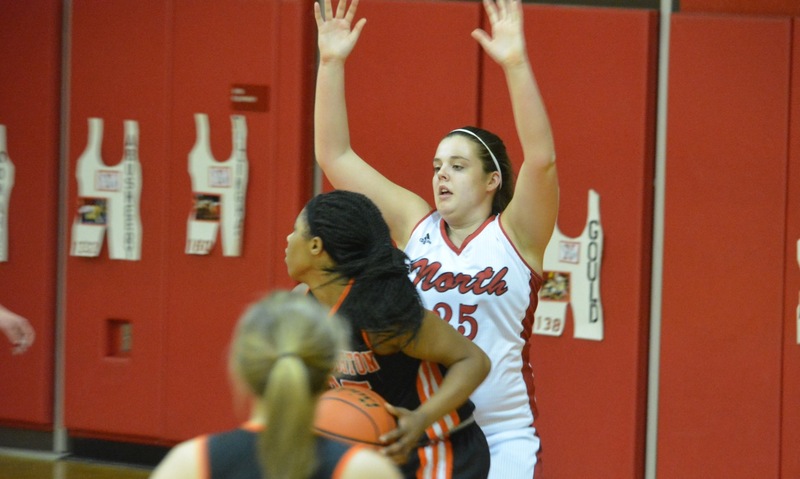 North was led by senior Emily Peters who snagged 13 rebounds, while Collard had 11, Kiersten Bixby had nine and Haskell grabbed eight. Stoughton will try to find its shooting touch before the visit of Canton on Friday. The Black Knights still need two wins to qualify for the postseason and Steele Jordan is confident the team will be able to put Tuesday night’s struggles behind it. Stoughton (7-6, 7-5) will be at Canton on Friday, while North Attleboro (9-5, 8-4) will be at Attleboro. North Attleboro, 70 @ Stoughton, 78 – Final – Cam Andrews scored 18 of his game-high 23 points in the second half to pace the Black Knights. Ryan Sullivan tied a career-high with 16 points, Brandon Teixeira had a double-double with 15 points and 11 rebounds and Elson Lopes added 11 points and five assists. North Attleboro’s Jonny Friberg had a career-high 23 points and added 13 points while Brent Doherty had 20 points. Milford, 29 @ Mansfield, 56 – Final – Caroline Maher led the Hornets with 14 points, while Olivia Broyles added a career-high 12 points. Katie Irwin was the top scorer for the Hawks with 11 points. Stoughton, 26 @ North Attleboro, 45 – Final – Samantha Taggart and Caroline Collard were the top scorers for North with nine points apiece. Ashley Ahern added seven and Emily Schromm six points for the Rocketeers, while Emily Peters chipped in with 13 rebounds. 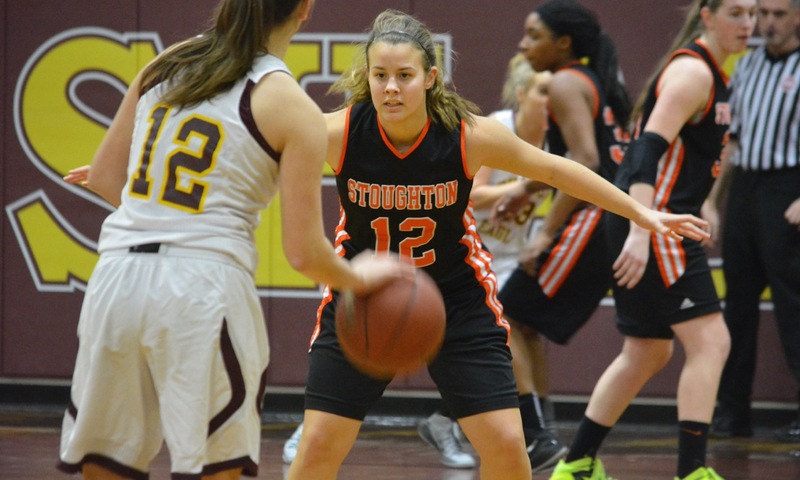 Alecia Quinones led Stoughton with 11 points, all in the third quarter, and Val Whalen added six points and 16 boards. Milford, 36 @ Foxboro, 40 – Final – With the victory, the Warriors clinch the outright Davenport division title. Canton, 51 @ Attleboro, 60 – Final – With the game tied, Attleboro used an 8-0 run to start the fourth quarter and used that as separation to beat Canton. Jake Dunkley had a game-high 18 points and added seven rebounds, Andrew Milliken had 10 points and six rebounds and Kevin Aguirre chipped in with a career best 10 points. Foxboro, 64 @ North Attleboro, 57 – Final – Jason Procaccini and Alex DuBrow each scored 18 points for the Warriors and Rob Lowey added 10 points. North Attleboro senior Ridge Olsen had a game-high 19 points and junior Brent Doherty added 17 points. Milford, 58 @ Franklin, 74 – Final – Final – Milford had a lead midway through the third quarter but the Panthers outscored the Scarlet Hawks 36-18 over the final 12 minutes of play. Franklin freshman Jay Dieterle tied a career-high with 24 points while sophomore Connor Peterson chipped in 14 points. Milford’s Dwight Anderson had 19 points and Anthony Arcudi added 11 points. Oliver Ames, 57 @ King Philip, 62 – Final – Tom Madden might have scored just eight points but KP head coach Matt Coute said they all came at a big time, including a fourth quarter three. Madden added a career best 10 rebounds as the Warriors rallied from a halftime deficit. Noah Goodwin led the Warriors with 18 points and Seth Sullivan added 16 points. Oliver Ames’ Carter Evin had a game-high 21 points and Tim Kelley added 13 points. Sharon, 62 @ Taunton, 59 – Final – Up three, the Eagles elected to foul to send the Tigers to the line instead of giving them a chance to tie. Taunton missed the front end of the bonus and Sharon was able to hold on. Sharon had 11 players score with junior Peter Banks leading the way with 12 points, Matt Lowerre adding 11 points and Michael Zola adding nine points. Taunton’s Quan Roberson had a game-high 18 points while Tommy MacLean and Jose Mercado each added 11 points. Mansfield, 70 @ Stoughton, 52 – Final – Junior Christian Weber connected on six three pointers for a career-high 19 points and the Hornets stretched a five point lead at the end of three into an 18 point win. Nick Baskin added 13 points and Max Boen had 11 points and five rebounds. Attleboro, 61 @ Canton, 28 – Final – Sarah Deyo scored 19 points, Emily Houle scored 14 points and Samantha Pierce added 12 points for Attleboro. Canton’s Hannah Jerrier led the Bulldogs with eight points. North Attleboro, 53 @ Foxboro, 49 – Final – North Attleboro was led by Ashley Ahern, who scored 23 points, while Caroline Collard added 12 for the Rocketeers. Ashley Sampson had 24 points for Foxboro. Franklin, 68 @ Milford, 42 – Final – The Panthers broke the game open with a 24-6 second quarter. Lauren Rudolph was Franklin’s top scorer with 14. Aubrie Kutil added 12 points for the Panthers and Olivia Adiletto had 10. Milford’s Kate Irwin finished with 13 points. King Philip, 27 @ Oliver Ames, 40 – Final – Kayla Raymond paced the Tigers with a double-double of 14 points and 10 rebounds and senior Kaitlyn McCarthy scored 12 points. With the win, OA coach Laney Clement-Holbrook broke the state record for career victories with her 634th win. KP was led by Julia Leroux with eight points and Christina Hathaway with seven. Mansfield, 51 @ Stoughton, 36 – Final – Meg Hill and Caroline Maher were the top scorers for the Hornets, each with 17 points. Alecia Quinones had 16 points and nine rebounds for Stoughton. Taunton, 30 @ Sharon, 43 – Final – The Eagles broke open a tight game by scoring 20 points in the fourth quarter to pull out the victory. Charlotte Ransom led the way for Sharon with 12 points and eight rebounds, while Shira Stoller had nine points and four assists and Veronica Wallace added nine as well. SHARON, Mass. – Heading into the fourth quarter, first-year Stoughton coach Charmaine Steele Jordan let her team know that she was frustrated. Jordan, one of the program’s all-time top scorers during her playing days, urged the Black Knights to compete for the name on the front of the jersey. Stoughton got the message and turned around a four-point deficit in the fourth quarter at Sharon on Friday night to pull out a 52-49 victory that leaves the team just two wins away from a return to the state tournament. The Black Knights came out of the huddle with renewed energy to start the fourth quarter and it did not take them long to get back into the game. Bridgette Whalen knocked down the first of two free throws to cut the lead to three and then Alecia Quinones (17 points and 11 rebounds) snatched the miss to save the possession. Quinones swung the ball around to the top of the circle and senior guard Sarah Quattrucci, who banked in a three-pointer to tie the game at 42-42. Sharon responded quickly to regain the lead. Sophomore Shira Stoller (five assists) threw a perfect pass through the Stoughton zone to classmate Angela Wallace who finished the layup and was fouled. Once again it was Quinones that made a big play for Stoughton. The league’s leading scorer (averaging more than 20 points per game) snatched a crosscourt pass and took it the length of the court for a layup that cut the lead back to one. Jess Greer (game-high 18 points) buried her fourth three of the game to give the Black Knights the lead and Quinones made one of two free throws to make it 48-45. After Alyssa Piazza (11 points, seven rebounds) made to from the line, Wallace knocked down a pair to give the Eagles a one-point advantage. Wallace finished with a career-high 15 points to lead Sharon. “She was playing AAU in the spring and fall and gained more confidence there,” said Sharon coach Cliff Tomassian of Wallace, who played on varsity as a freshman but was still mentally recovering from a torn ACL she suffered as an eighth grader. After an Ava Siegel free throw tied the game, Quinones snatched another defensive board and quickly looked ahead to Greer, who had leaked out, for an easy transition bucket that gave the Black Knights the lead for good. When the game began, it looked like Stoughton might be able to run away with an easy win. The Black Knights jumped out to 7-0 lead behind four points from Quinones. Sharon, coming off a 40-point loss to Attleboro on Tuesday, looked shaky but after a timeout started to settle down and finished the quarter with a 7-0 run of its own. The second quarter unexpectedly turned into a shootout. Sharon got off to a strong start thanks to two quick buckets from Stoller. The point guard started to look for her own shot and to find seams in the Stoughton zone off the dribble. Wallace also provided a spark in the second with six points, while freshman Emma Eberhardt added all four of her points in the quarter. Stoughton countered with its outside game. Greer knocked down three of her four three-pointers in the second to give the Black Knights a spark and as halftime approached the visitors led by one, until Stoller knocked down a shot from just beyond half-court that put Sharon in front 28-26 at the break. The third quarter was similar with the two teams trading blows. Quinones scored six in the third, but was matched by Piazza, who scored six of her 11 points in the quarter, and Stoller who knocked down a step-back, fall away jumper to put the Eagles up four. Stoughton (7-3, 7-2) rallied in the fourth quarter to pick up the win and to keep pace with Oliver Ames atop the Davenport standings. The Black Knights will face both league leaders next week starting with Mansfield on Tuesday. Sharon (3-8, 1-8) will try to bounce back against Fontbonne Academy on Sunday. Franklin, 63 @ Attleboro, 53 – Final – Franklin was led by freshman Jay Dieterle, who scored 16 points. Paul Mahon added 13 for the Panthers. Jake Dunkley had 17 points and five rebounds and Kyle Murphy added 13 points and 12 boards for the Bombardiers. Canton, 53 @ Foxboro, 73 – Final – Foxboro was led by Jason Procaccini with 22 points. Alex DuBrow and Rob Lowey each chipped in with 14 points for the Warriors. Canton freshman Devin Foster netted a team-high 12 points. Mansfield, 73 @ King Philip, 50 – Final – Sam Goldberg was the top scorer for the Hornets with 14. Tyler Boulter (13) and Matt Ehrlich (11) also got into double digits for Mansfield, which had 11 players on the score sheet. Tom Madden led KP with 15 points. Oliver Ames, 55 @ Milford, 44 – Final – Carter Evin paced OA with 18 points. Nick Welch also had 14 and Shawn Cardoza had 12 for the Tigers. Taunton, 62 @ North Attleboro, 60 – Final – Jose Mercado and Tommy MacLean each scored 19 points in the win as Taunton avenged a loss from the first meeting. North was led by Jonny Friberg with 16 ponts. Mario Bresko and Brent Doherty added 14 points apiece for the Rocketeers. Sharon, 69 @ Stoughton, 67 – Final – The Eagles got 15 points from Andrew Filipkowski and eights points each from David Roelke, Michael Zola, and Peter Banks. Brandon Teixeira led the Black Knights with 18 points and 10 rebounds and Cam Andrews added 17 for the Black Knights. Foxboro, 64 @ Canton, 40 – Final – Senior Cassidy Harrison led the way for the Warriors with 20 points and Lily Sykes added 11. 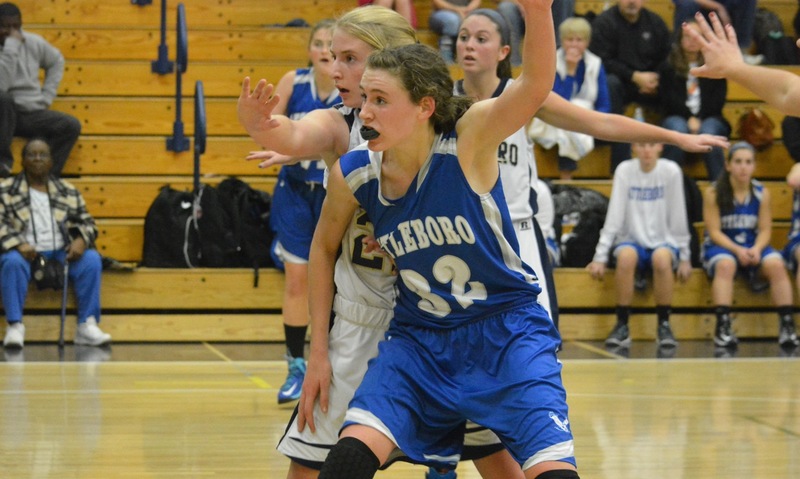 Attleboro, 56 @ Franklin, 48 – Final – Emily Houle led the Bombardiers on Friday with 22 points. Milford, 30 @ Oliver Ames, 47 – Final – With the victory, OA coach Laney Clement-Holbrook ties the state career wins record with 633. Senior Kaitlyn McCarthy was the high scorer for the Tigers with nine points and classmate Sam Bamford added eight points. North Attleboro, 46 @ Taunton, 47 – Final – Jordan Wade was the top scorer for the Tigers with 16 points. Alyssa Gibson had seven points and 14 rebounds and sophomore Hannah Moniz scored eight points for Taunton, which has now won two in a row. Stoughton, 52 @ Sharon, 49 – Final – Jess Greer led the Black Knights with 18 points and Alecia Quinones chipped in with 17 points and 11 rebounds. Angela Wallace had a career-high 15 points for Sharon and Shira Stoller and Alyssa Piazza each had 11. Oliver Ames boys, 79 @ Sharon boys, 91 – Final – With the win, Sharon clinched the Davenport title. Oliver Ames @ Masconomet Quad – The Tigers went 3-0 to improve to 19-5 on the season. OA beat Arlington 51-12, Masco 48-32, and Burlington 42-32. Anthony Berksza (138) went 3-0 in the meet and Ryan Lehane (152) went 3-0 with three pins. With nearly half of the games gone for all of the Hockomock teams, our editors Ryan Lanigan and Josh Perry take a look at where things currently stand for girls’ basketball. Who is the midseason girls’ basketball Player of the Year? Josh Perry – Attleboro has been snakebitten with injuries this season. Just two games in and Player of the Year candidate Emily Houle and senior starter Emma Vlashi were both knocked out with knee injuries (both have returned and been productive for the Bombardiers) and then in game three junior forward Julia Strachan went down with a season-ending injury. Despite losing three-fifths of the opening night starting lineup, Attleboro is currently 10-1 overall and just one game back of Mansfield in the Kelley-Rex standings. Much of that success can be placed squarely on the shoulders of Sarah Deyo. The junior forward is second in the league in scoring with 18.2 points per game and has been a double-double machine even as teams turn all of their defensive focus on her. After missing a game due to an arm injury, Deyo returned to score 20 points in a big win over Taunton. Attleboro still has a chance of bringing home its first Hockomock title largely because Deyo has been able to carry the team during the first half. Ryan Lanigan – Foxboro is just one game out of first place at the midway mark in a very tight Davenport Division race and a big reason has been because of the player of Ashley Sampson. The sophomore is third in the league in scoring with 15.6 points per game and has been a big player for Lisa Downs and the Warriors so far this season. Sampson has the ability to cut through defenses, which can open up a lot of looks for a young Warriors team that can really stroke it from deep. She’s also one of the better shooters in the league and is tough to get around defensively. Who is the midseason girls’ basketball Underclassman of the Year? Perry – There are so many great choices from Kayla Raymond at Oliver Ames or Sam Pierce at Attleboro or Meg Hill at Mansfield, which is really just the tip of the iceberg for young talent in the league, but my pick right now has to be Foxboro sophomore guard Ashley Sampson. Coming off a breakout rookie season, Sampson grew a couple of inches in the off-season and seemed to grow even more confident in running the offense as well. She is currently averaging 15.6 points per game and seems to be stepping right into the considerable hole left by the graduation of Kat Tamulionis. Sampson is the primary ballhandler and despite being the target of every team’s defensive game plan still manages to get to the basket and to find her teammates for open looks. She has also emerged as a strong on the ball defender, the spark for the Warriors run and gun style, and even a contender for Player of the Year. Lanigan – Since I picked Ashley Sampson as my current Player of the Year, I’ll go in a different direction here and go with Attleboro’s Samantha Pierce as the top Underclassman at the halfway point. The Bombardiers have been ravaged with injuries but one of the few constants in the lineup for Attleboro has been Pierce. She can knock down shots from deep and is a very good rebounder, especially for just a sophomore. The combo of Pierce and Sarah Deyo make it hard for opponents to get much going at the basket but Pierce can also stop out and guard on the perimeter. When Attleboro has needed someone step up through its injury issues this year, Pierce has been a big help. Perry – I think that everyone expected Stoughton to get a boost this year from the hiring of Charmaine Steele Jordan. One of the program’s best ever players and all-time leading scorers, she brings plenty of on the court experience and a renewed energy around the team, but it would have been hard to predict coming in that the Black Knights would be 6-2 at this point, with a win over Attleboro, and with Alecia Quinones leading the league in scoring at more than 20 points per game. Stoughton is only a few wins away from qualifying for a return to the state tournament and is tied for the league lead with Oliver Ames. While things could get tougher for the Black Knights in the next couple of weeks (North, Mansfield, a rematch with Foxboro, and two games against OA are still left on the schedule) but to be in this position at this stage is still a great accomplishment and a big turn around for the program. Lanigan – When we released our preseason Hock 5 rankings, we had Oliver Ames at No. 5. With a couple nice pieces back, we thought the playoffs would be within reach. As of this past week, we have them at No. 2 and not only is a playoff spot possible, but a Davenport title is a possibility. Laney Clement-Holbrook has the Tigers playing at a great pace and with strong leadership from Sam Bamford and Kaitlyn McCarthy, a lot of the younger pieces like Francesca Calabraro, Niyera Mitchell, Kayla Raymond and Hannah Carroll have been able to step up and make big plays. Although OA making a run for the division title and possibly a deep postseason run is my pick, we should never be surprised when OA has success with Laney Clement-Holbrook on the bench. At this point, which team will be going furthest in the tournament? Perry – There are a lot of teams that have the potential to make a run in the tournament this season. The Hockomock is one of the deepest girls’ basketball leagues in the state and certainly does a lot to prepare teams for the rigors of making a push in the postseason. However, D1 South is an absolute bear with the likes of Braintree and Feehan (the top two teams in the state), so the road is extremely difficult for Attleboro and Mansfield. Oliver Ames is my pick right now for the team with the chance to go furthest as the Tigers look to have the balanced scoring and the defensive intensity to give teams in D2 South fits. Also, OA is coming off a solid win over Foxboro, which would probably be the second favorite to make a push for a return to the D2 South final. Although I think OA is the team that will be go the furthest, keep an eye on Franklin in D1 Central. The Panthers have a habit of reaching sectional semifinals and after a big win over Holy Name in the season opener will have thoughts of challenging Westford, A-B, L-S, and Wachusett for the district title. Lanigan – This is always a tough one and I truly believe that the Hockomock League is one of the toughest for girls basketball this season. Oliver Ames is likely to be a threat in D2 South and Franklin should be the most battle tested team in D1 Central. But my pick is for Mansfield. The Hornets have faced a number of stiff tests so far this year and so far, they have come out on the winning side. They picked up wins on the road at North Attleboro, Oliver Ames and Franklin and then came home to beat Foxboro. Each time so far this season when you think that Mansfield might drop one to another team in the Hock 5, they have emerged victorious. They still have two big tests with Attleboro left and a date with a strong Stoughton team next week. If they can get a strong seed in the D1 South bracket, I can see them making a return trip to the South Semifinals. If Attleboro can get healthy and avoid the injury bug, they will be another team to look out for in D1 South.